Henry Albert Jones was almost certainly born in Liverpool in 1851. Unlike many Vancouver pioneers he seems to have stuck to the same year of birth in all the records we’ve looked at. His father, James was Welsh, and one census identifies Harry Jones as Welsh as well, but all other records say he was English. We don’t know when he left England, but we know he went to the USA because he was married to Jennie (sometimes recorded as Jane) Richards in Franklin, Ohio in 1875 and had three children, Edith in 1878 in Columbus, Walter, born in 1879 when the family were in Shawnee, Perry County Ohio (who seems to not survived) and Eleanor, sometimes known as Nellie, in 1880 in Cincinnati Ohio. We know Harry Jones arrived in the town of Granville before the fire and the change of name to the City of Vancouver, so some time before mid 1886. He’s listed as having an office on Carroll Street (sic) in the 1887 publication “City of Vancouver, Terminus of the Canadian Pacific Railway” We can find his office on Cordova Street in an 1888 Street Directory. 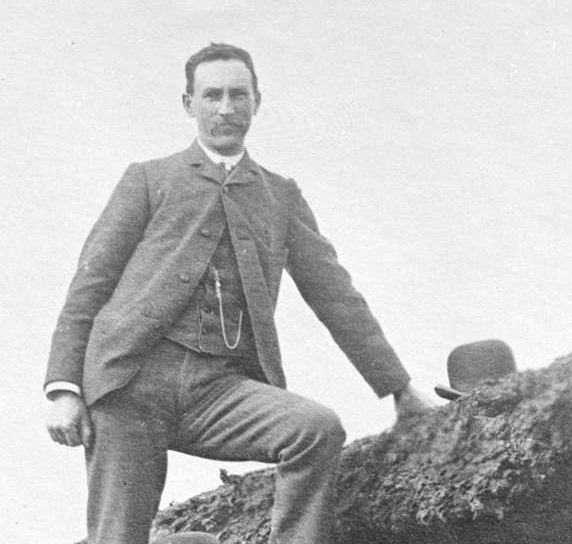 In 1890 he was one of the founders of the Vancouver Loan Trust Savings and Guarantee with at least three other partners; H T Ceperley, J W Horne and R G Tatlow. He was also identified by Mr. H.P. 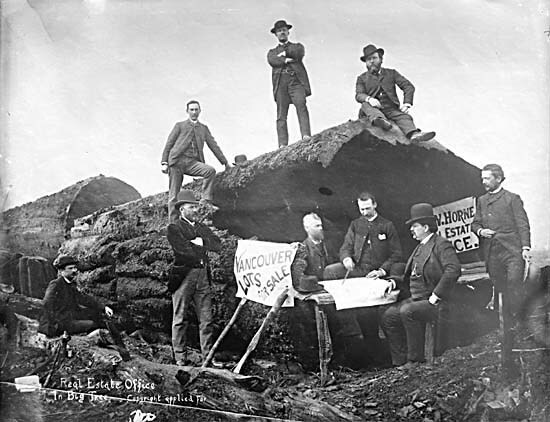 McCraney, ‘a very early pioneer’, in conversation with Major Matthews as being in this noted Vancouver image, supposedly taken by Harry Devine in 1886 on Granville Street soon after the fire. In 1891 the family of real estate agent Henry A Jones, Jennie, his wife, and daughters Edith (13) and Nellie (11) are shown in the census living in Victoria, and his home is shown on Cook Street in the BC Directory. There was also real estate agent, Henry A Jones, Clara, his wife, her mother and their domestic Laura Drake shown living in Vancouver. Henry was listed in the BC Directory that year as a notary public in Vancouver, as well as agent for Atlas Fire Insurance at his offices on Cordova Street, and his home address was on Georgia (at Bute). He was listed as having $20,000 worth of property in 1889, doubling to $40,000 only two years later. 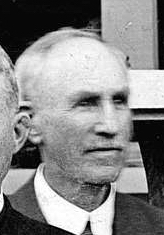 We know that Henry and Clara married in Columbus Ohio in 1889, so perhaps for the sake of appearances, or to protect the children, H A Jones led a double life; presumably unintentionally he increased the population count of the Province at the same time. 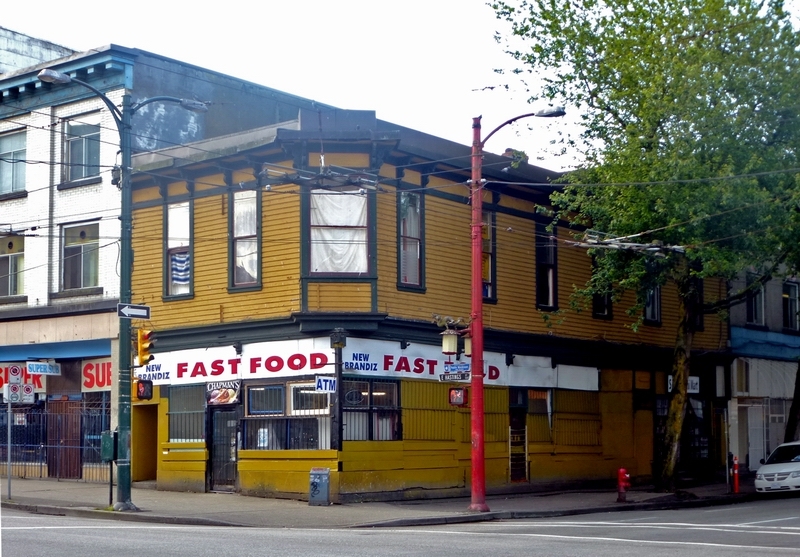 The first building that is identified with Harry is 100 East Hastings, built in 1893. His name is on the water hook-up for the building, now one of the oldest wood-frame structures in the city. In 1898 Harry chartered the small steam tug On Time, creating the Vancouver Tugboat Co. Jones retired in 1919 and for a while the company was inactive. It was re-established in 1924 by Harry’s children, Harold and Ruth. During the 1930s the company built up its scow and barge operations, especially the barging of sawmill waste to pulp mills. In addition to being the largest tug and barge operation on the lower coast, Vancouver Tug also owned Vancouver Shipyards; in 1970 it merged with another tugboat company to become Seaspan, today part of the Washington Group. 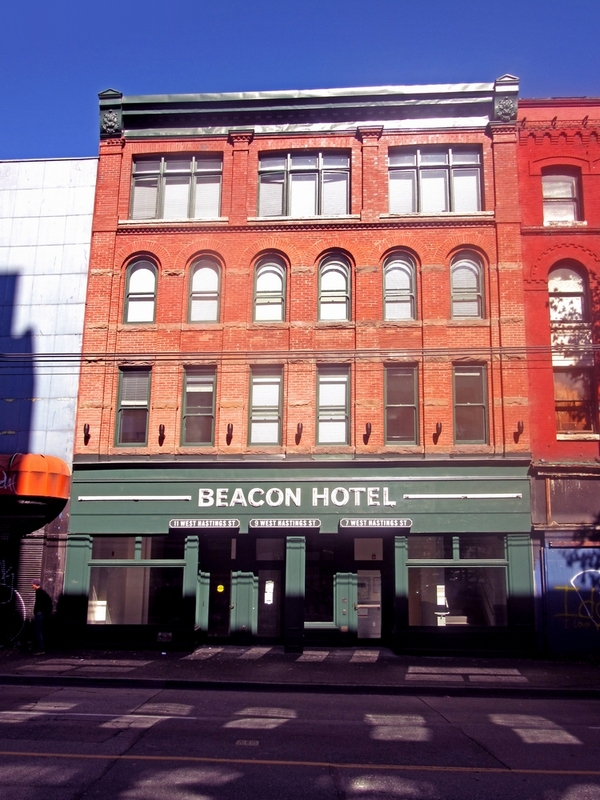 In 1899 Harry almost certainly developed this West Hastings building, now known as the Beacon Hotel. His name is in the 1900 Street Directory as occupying the West Hastings Street building, and he’s still paying for repairs as owner in 1915. As well as his business activities, Harry had a busy time with family events. His daughters from his first marriage were both married. In 1898 Edith Jones was married in New Westminster to James Lusier. In 1899 Eleanor Jones married Arthur Wellesley Gray in New Westminster. Edith’s first marriage didn’t last long; in 1901 she was living in New Westminster with her mother (listed as Mary Jones) and her two-year-old daughter, also called Edith, and was divorced. By 1906 Edith was married again, to William Greenlees, owner of a wharf and bridge construction equipment company. They had four daughters, and Edith died, aged 70, in 1948. Eleanor’s marriage lasted until 1912, the year she died. Her widower was elected as mayor of New Westminster a year after her death, and then entered provincial politics, becoming Minister of Lands from 1933 to his death in 1944. In the 1901 census he was called Henry, born in England and as well as Clara there were two children, Ruth, aged 8 and Harold aged 6 and Laura Drake, their domestic. Both children had been born in the US, although there’s no sign that the family weren’t living in Canada for any extended period. In 1911 he was living with Edith and his son-in-law William, and was shown as being called Harry and born in Wales. The third building that Harry Jones built was known as the Laursen Building. The building permit dates from 1920, although it doesn’t tell us who the architect was. It was built at a cost of $15,000 by Baynes and Horie. 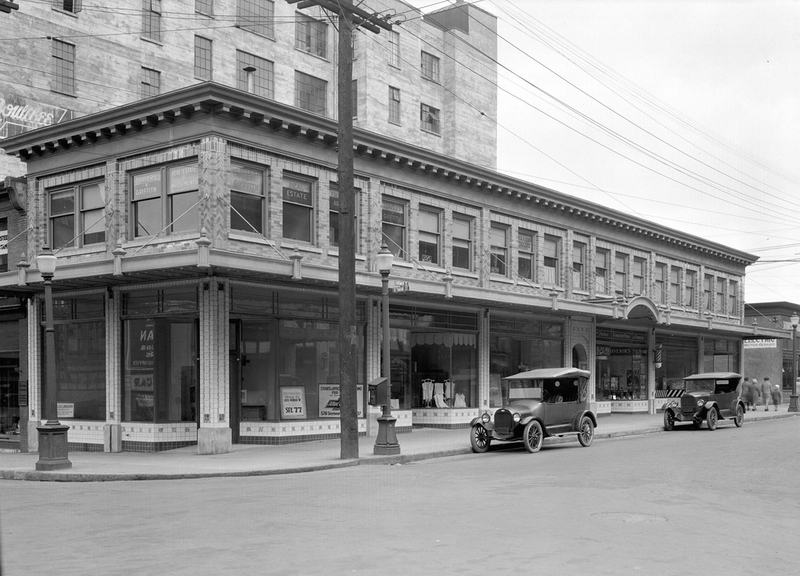 Harry Jones ran his real estate agency from the building (addressed as 592 Seymour) in 1922; His son, Harold Jones, also worked from here as a manufacturer’s agent selling wire rope. In 1922 Harold lived on Trimble Street, but a year earlier in the 1921 Directory he was living at 590 Seymour, where Harry is shown living in the 1921 census, having moved from Cordova the year before. In the 1921 Census he was shown married to Madge, 20 years younger, and born in Norway. We have a picture of Harry in 1922, because he attended the Pioneer’s Picnic on Bowen Island that year. He didn’t occupy his offices here for very long, as he died in California in 1923. What was added and when?